Croydon Council and Croydon Police, working as the Safer Croydon Partnership, have launched a campaign to combat mobile phone robbery among young people. Those aged 13-17 are more likely to be victims of robbery than any other age group, and the item most likely to be stolen is their mobile phone. The campaign aims to raise awareness among young people about protecting themselves and their property and prevent them from becoming victims of theft. 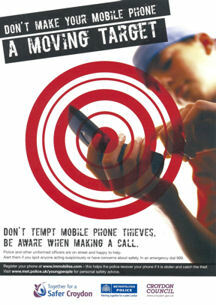 The message is – don’t make your phone a moving target – stay aware when using it in public places. Posters will go up in secondary schools, youth clubs and at transport hubs across the borough. Police and council officers will be handing out leaflets to young people at bus and train stations and other busy areas. A key element of the campaign is to get people to register their phone at www.immobilise.com . Doing this can help the police to recover property if is it is stolen and to catch the thieves. We would advise anyone who has a mobile phone, whatever their age, to register it on www.immobilise.com as soon as possible. If it is stolen, it increases your chances of getting it back. It also helps the police to catch those responsible and bring them to justice – taking robbers off the streets. When you register your phone on the website, please tell them you heard about www.immobilise.com from the Safer Croydon Partnership. The Manchester Messenger has reported that young people across Trafford are being urged to keep new gadgets received as Christmas presents out of sight to avoid becoming a victim of street crime. Greater Manchester Police say January is a peak time for robberies and muggings as people step out with valuable new gifts such as mobile phones and MP3 players. Statistics also show young people are the most likely victims. In January 2009 there were 56 robberies across Trafford compared to 32 the previous month. We’re advising people to leave their valuables at home or keep them out of sight when they are out and about on the street, in parks and on public transport. It’s worth remembering that while most people are out hunting for bargains in the sales, criminals may be on a spree of a different kind, especially in busy high street areas. Most robberies are opportunistic, so by keeping valuables out of view you can reduce your risk of becoming a target. Bike theft! Not in My Neighbourhood! Police across Taunton and Wellington will be engaged with their partners in various activities under the “Not in My Neighbourhood Week” banner this week to tackle crime and antisocial behaviour. Not In My Neighbourhood week is a national home office scheme, now in its third year, which encourages people to learn more about work being done to tackle crime and other problems in their area and is a great opportunity for local agencies, the Police and other partners to show-case the work they do to make communities safer and improve their quality of life. A range of initiatives will happen over the course of the week such as operations to tackle anti social behaviour, dangerous driving, and drugs to more light-hearted events such as crime reduction bingo for elderly residents. Not in My Neighbourhood Week is a great opportunity to proactively work with people to find out what their main concerns are and show the general public that we are tackling the priorities they have identified. Also launched this week as part of the “Not in My Neighbourhood” activities, Police will add some sparkle and shine to the streets of Somerset West with the start of “Operation Glitter”, their winter-long “Cycle Safe” campaign. The scheme is being run by staff at Taunton and Wellington Police Stations between November 2009 and February 2010 in partnership with Ralph Coleman Cycles, Halfords, Bicycle Chain, Kings Cycles and Ian’s Cycle Centre. 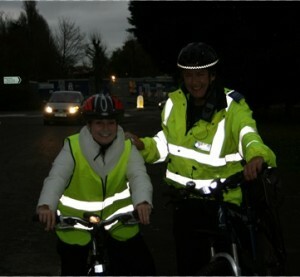 During the campaign the police will work with cyclists and the public to help promote safe cycling with an aim to reduce the amount of serious road traffic collisions, which happen because cyclists are not properly lit and to reduce cycle thefts at a time when many people receive new bikes for Christmas. Cyclists found without lights during the official hours of darkness, face being given a fixed penalty notice. However, if lights are then bought, the receipt and the notice can be taken to a police station to have the ticket written off. Officers will also provide information on how to protect your bike including how to register it on a national police website www.immobilise.com. Operation Glitter is a great opportunity to reinforce how important it is to have bicycle lights during the hours of darkness and wear the correct health safety clothing. This an educational drive to remind people of the legal requirement to use bike lights, we will be delaying a prosecution by requiring people we stop to produce their new lights with a receipt within 7 days. I would rather someone bought a set of lights than have to pay a £30 fine.